A gorgeous, if a bit short, new album by Cran's flute player, this is also somewhat unusual in that it concentrates on slower and sparsely arranged pieces, without the typical fast jigs and reels heard elsewhere. Desi chose to do something different, where he let the warm tones of his various wooden flutes be heard individually and in combination, with occasional tasteful additions of percussion, shruti box, accordion chords (Mairtin O'Connor), and vocal harmonies, and it works. 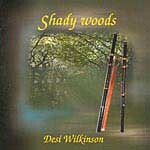 Desi's impeccable technique in the Irish idioms is enriched here by apparent borrowings from other musical cultures, as some of the sounds he produces are reminiscent of the shakuhachi. One of my favorite tracks, beside the opener, has to be "Wind that Shakes the Barley," not the well-known reel, but the air of the song relating to the 1798 rebellion. As the gorgeous air unfolds, with shakuhachi-like octave shifts, a ghostly chorus of men's voices (created by Desi and producer John Faulkner) is heard far in the background, suggesting the call of Ireland's martyrs from beyond the grave--a brilliant idea for an emotional piece. For the concluding track, Desi finally breaks down and, yes, plays a couple of reels, the popular northern tunes "Three Scones of Boxty" and "The Piper on Horseback." Still, he performs them on solo flute with restraint, at a pace that suggests more Breton gavottes than Irish reels.